When it comes to the development of vision and early eye health, parents will usually pick up if something isn’t quite right – and early diagnosis and treatment is vital. Although all children are different in their development, it is important to ensure that every visual milestone is being met. During the first seven years, it is essential for parents to keep a close watch on vision development. There are serious issues to be aware of – lazy eye, drooping eyelids, crossed eyes, and other congenital disorders, including cataracts. Cataracts are extremely common over the age of 60, yet it is estimated that one in 4500 children will either be born with or develop cataracts at an early age. There are two types: (1) congenital cataracts, which are present when a baby is born or shortly afterwards, and (2) developmental, infantile or juvenile cataracts, which are diagnosed in older babies or children. The obvious sign of a cataract is an eye that is hazy, white or simply not clear. It can also be detected by simply noting unusual red reflex on photos. A child can be born with it, or a cataract can be caused by trauma or medication. The only treatment is cataract surgery. For a newborn, it’s important that a cataract is removed as early as possible and replace it with an artificial lens if safe to do so. There is a critical period of 6 weeks – if a baby’s vision is compromised for longer than that amount of time, it will affect them for life. Misalignment of the eyes (or strabismus) is another childhood eye issue that requires attention. Commonly known as being cross-eyed or having turned eyes, parents may notice that one or both eyes turn inwards, outwards, upwards or downwards. This may happen constantly or intermittently. Either way, strabismus will not just ‘go away’ and it is important to have your child assessed and his/her vision development monitored. Watch your child’s eyes. If they look misaligned, have your GP or optometrist test them. He/she can then refer you onto an ophthalmologist, who will take you through all treatment options for the strabismus and any resultant amblyopia. Surgery will only be recommended when necessary. Amblyopia, commonly known as a lazy eye occurs when the brain does not fully acknowledge the images seen by the affected eye. Lazy eye almost always involves one eye only, but may affect the vision in both eyes. Many people make the mistake of saying that a person who has a crossed or turned eye (strabismus) has a lazy eye. They are not the same condition, although strabismus can cause lazy eye. Therefore, it is imperative that vision development is tested and monitored in these cases. Treating amblyopia usually involves placing a patch on the normal eye to make the weaker eye work harder. If a patch doesn’t work, drops may be used. 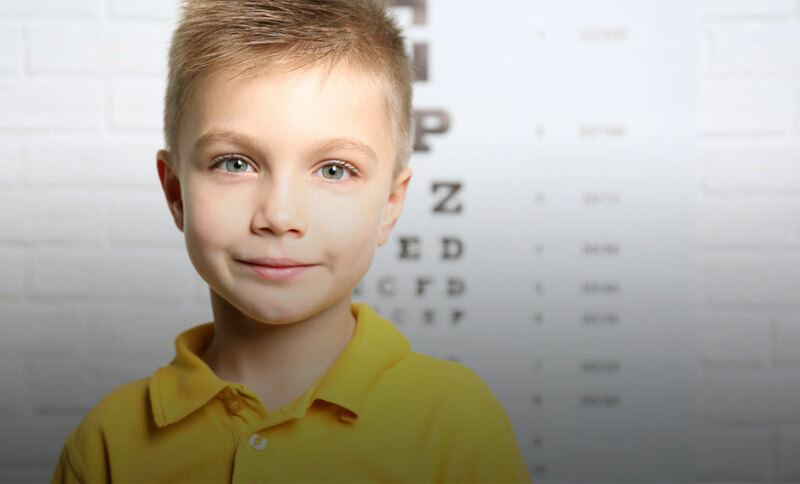 Of course, long-sightedness, short-sightedness or astigmatism can also develop in young children. The first signs are usually if a child is sitting too close to the TV or holding a book closely to their eyes. Teachers can also pick up clues from the classroom. Glasses will help the child participate in school and enjoy his or her playtime. If a parent thinks there is an issue, it’s important to seek help. The sooner we can take action, the better the outcome. And the better the outcome, the happier the child – and the parents.